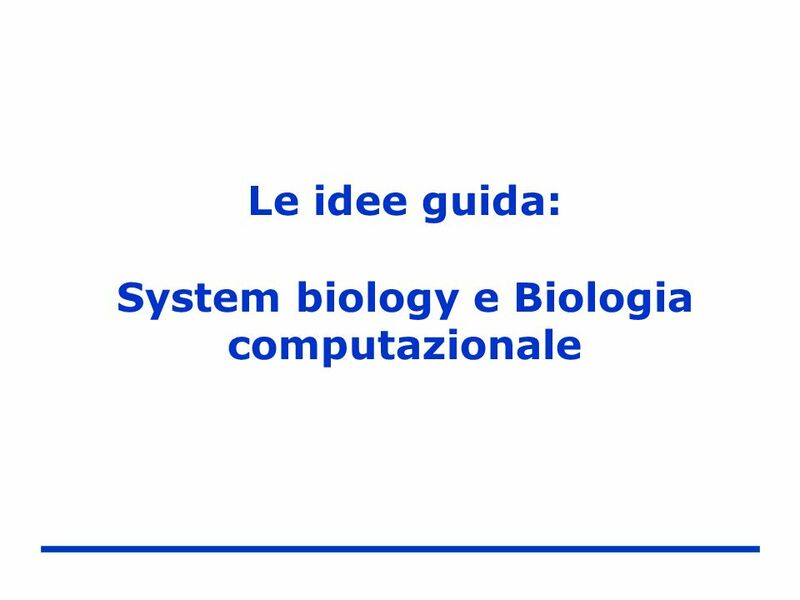 “System Biology”: un nuovo paradigma per la biologia molecolare. 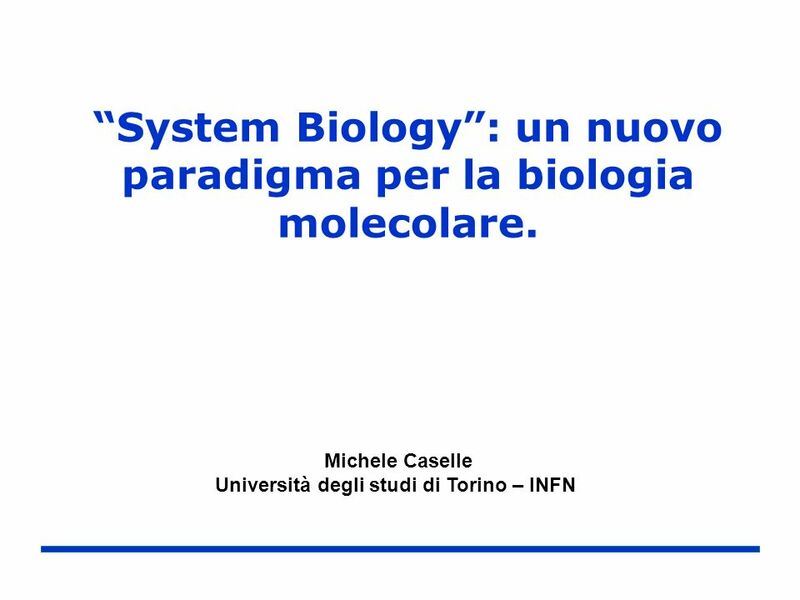 1 “System Biology”: un nuovo paradigma per la biologia molecolare. 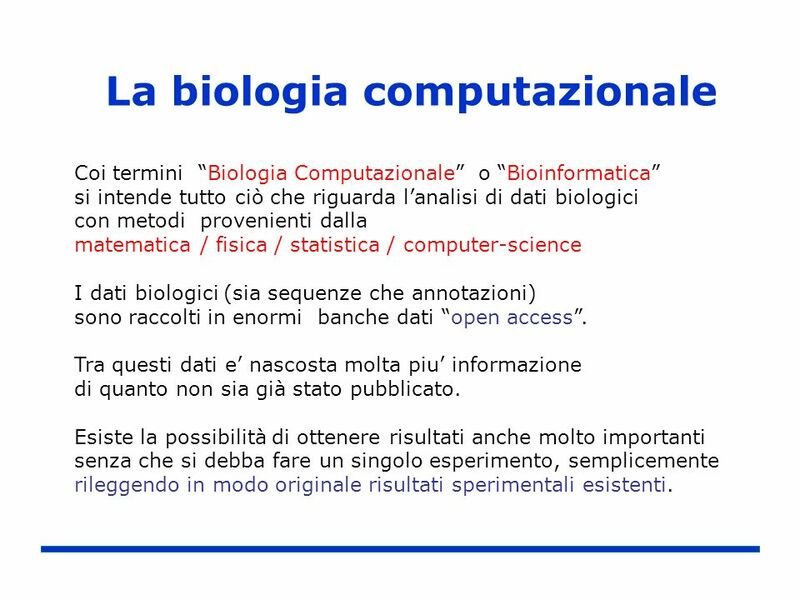 Coi termini “Biologia Computazionale” o “Bioinformatica” si intende tutto ciò che riguarda l’analisi di dati biologici con metodi provenienti dalla matematica / fisica / statistica / computer-science I dati biologici (sia sequenze che annotazioni) sono raccolti in enormi banche dati “open access”. Tra questi dati e’ nascosta molta piu’ informazione di quanto non sia già stato pubblicato. 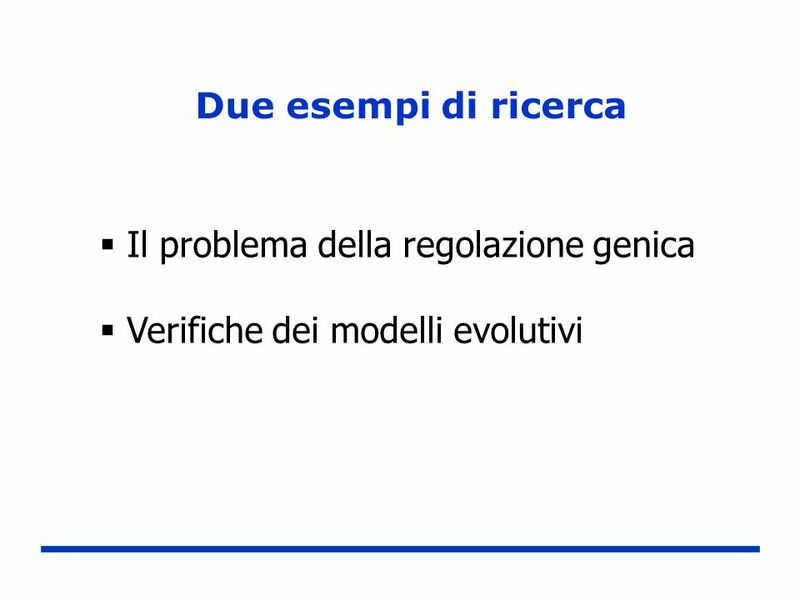 Esiste la possibilità di ottenere risultati anche molto importanti senza che si debba fare un singolo esperimento, semplicemente rileggendo in modo originale risultati sperimentali esistenti. 10 La cellula Ogni organismo vivente è composto da una o più cellule. 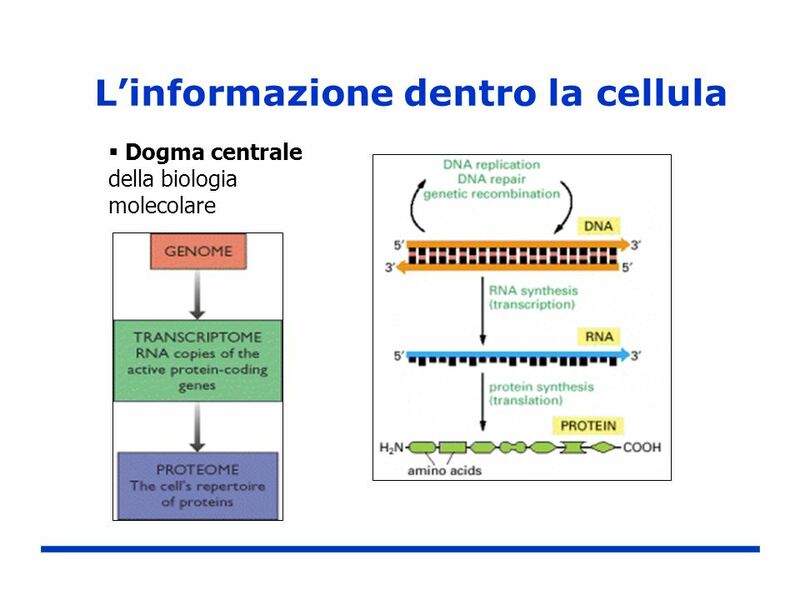 Ogni cellula può essere vista come una macchina complessa che esegue delle istruzioni scritte e memorizzate nel proprio genoma. 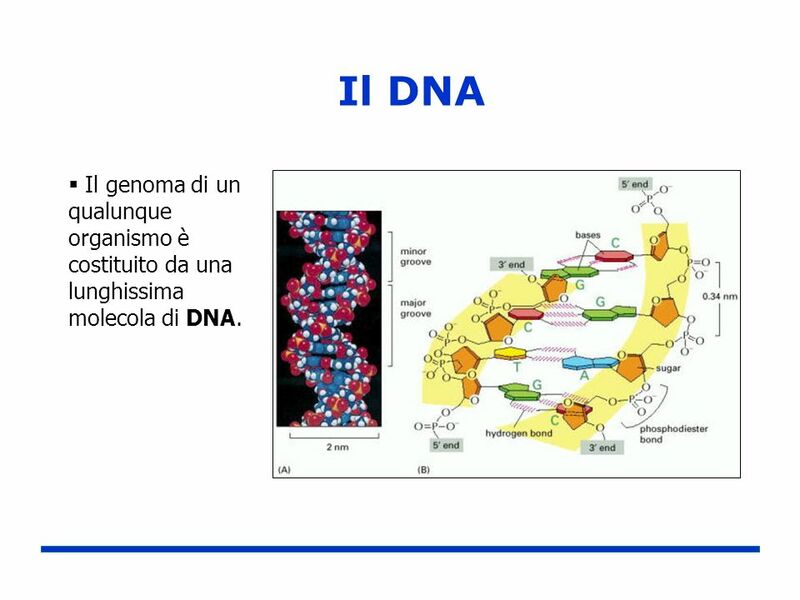 11 Il DNA Il genoma di un qualunque organismo è costituito da una lunghissima molecola di DNA. 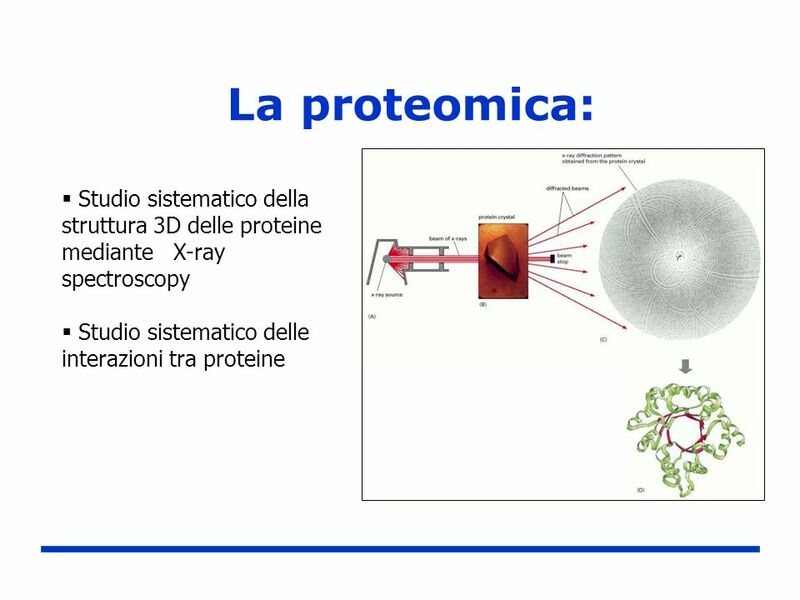 La maggior parte delle funzioni del nostro organismo sono eseguite da proteine. 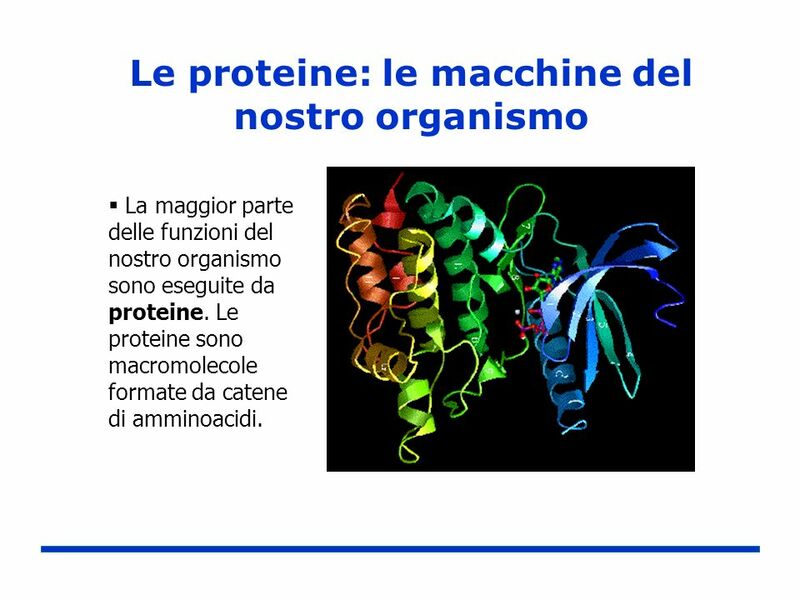 Le proteine sono macromolecole formate da catene di amminoacidi. 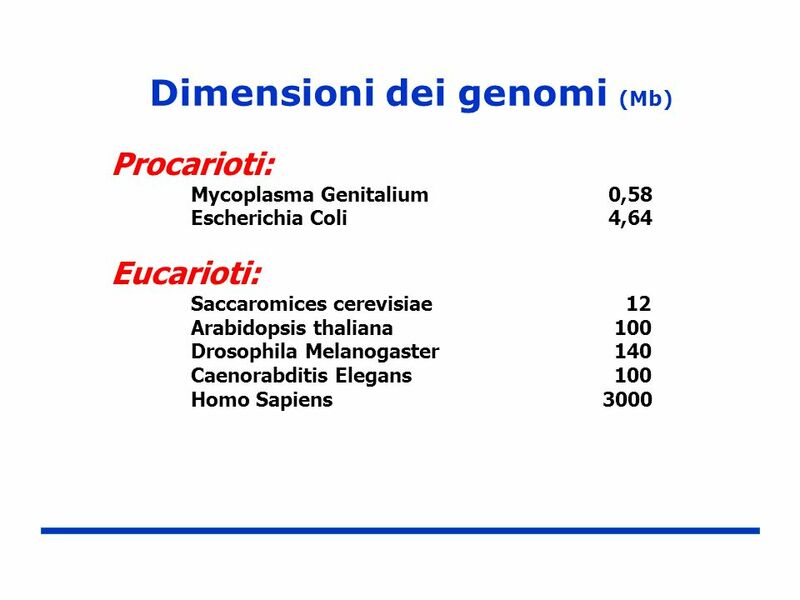 16 Il codice genetico Il passaggio dall’alfabeto con cui è scritto il DNA all’alfabeto con cui sono scritte le proteine avviene tramite il codice genetico. 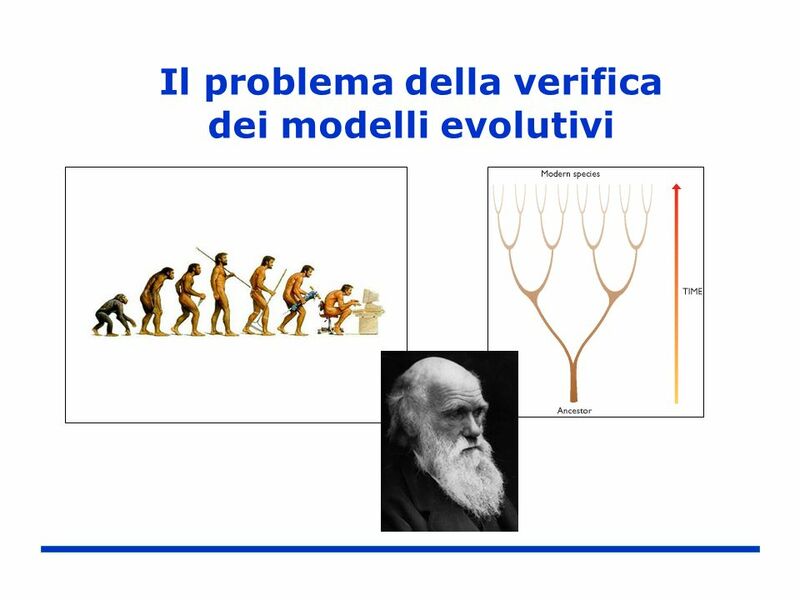 18 Perche’ si parla di una nuova “era” ? 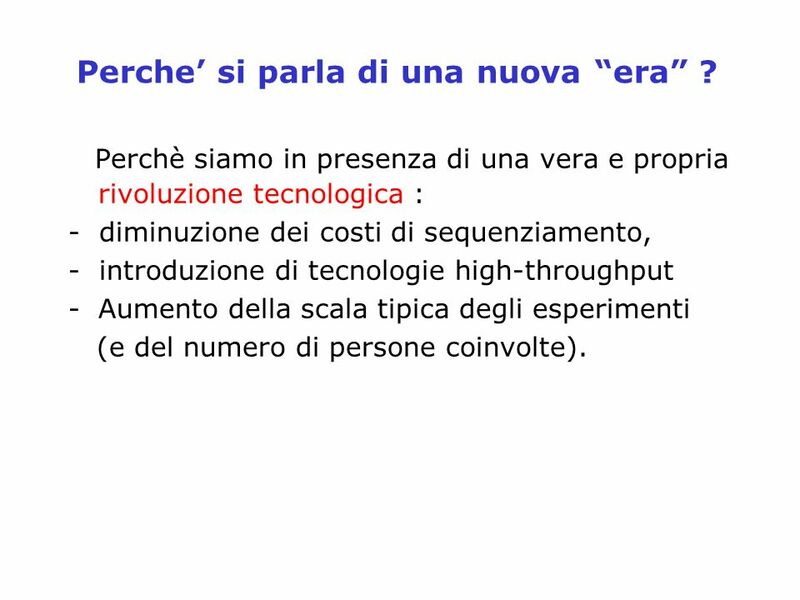 Perchè siamo in presenza di una vera e propria rivoluzione tecnologica : - diminuzione dei costi di sequenziamento, - introduzione di tecnologie high-throughput Aumento della scala tipica degli esperimenti (e del numero di persone coinvolte). 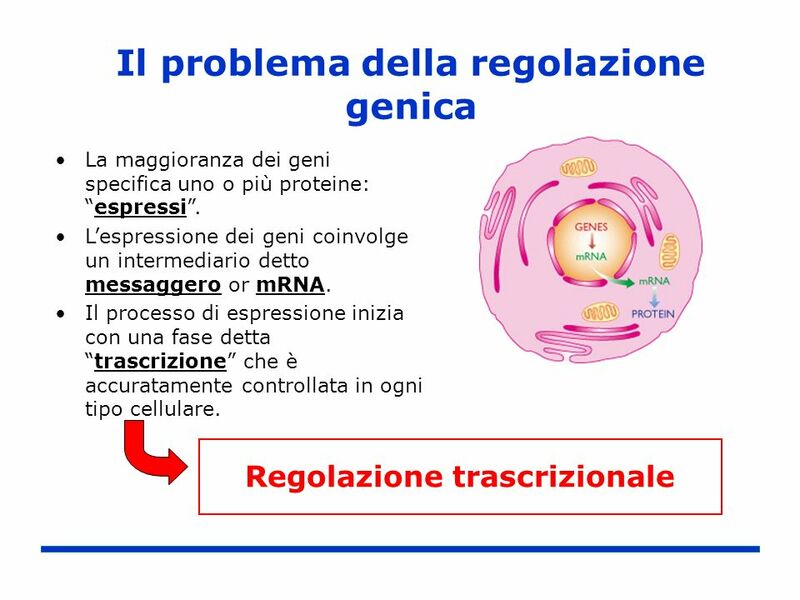 22 Struttura del Genoma La densita’ di sequenze codificanti proteine (o RNA) diventa sempre piu’ bassa man mano che aumenta la complessita’ dell’organismo. E’ molto alta nei Procarioti, media nel lievito, bassissima nell’uomo. 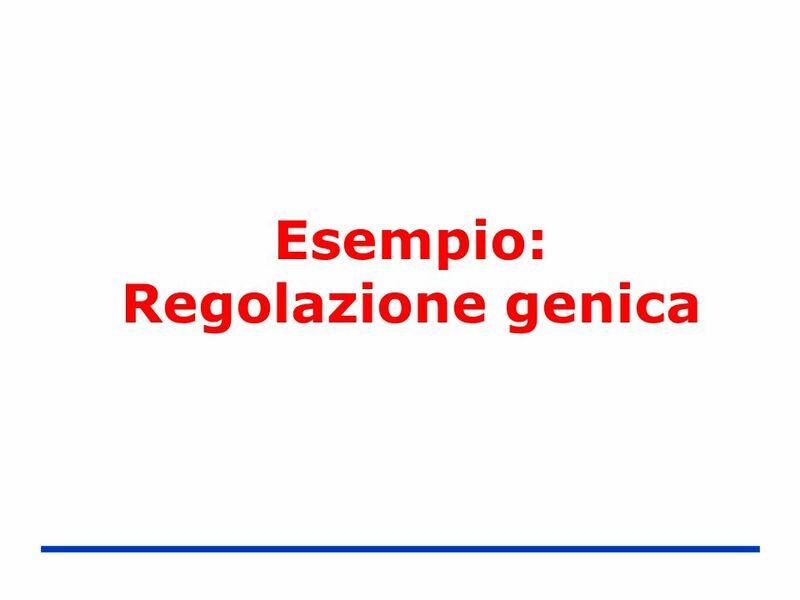 La maggior parte del genoma umano ( 99%) non e’ codificante ! 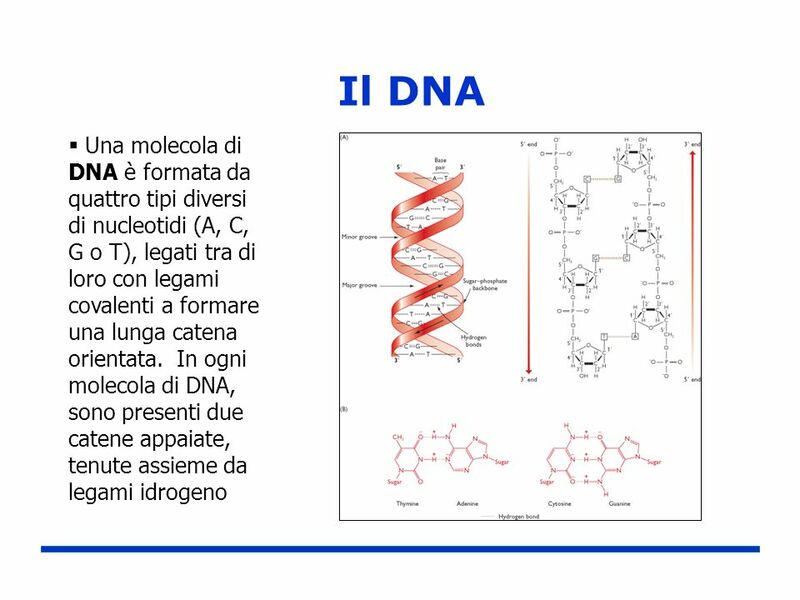 Questo DNA non codificante e’ (probabilmente) coinvolto nella regolazione dell’espressione genica. 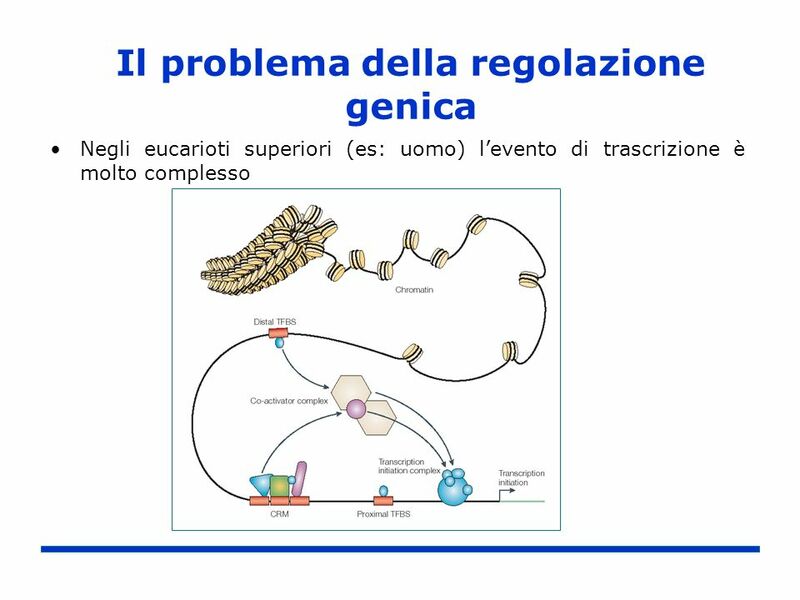 Negli eucarioti superiori (es: uomo) l’evento di trascrizione è molto complesso In higher eukariotes, the regulation of transcription is a very complex event. If you look at this picture, taken from a very recent review on Nature, you can distinguish the basic items involved in transcription of a certain gene. The DNA is usually packed in a very complex way, called “chromatin”, and, in this situation the DNA sequence is non accessible by the transcriptional machinery. 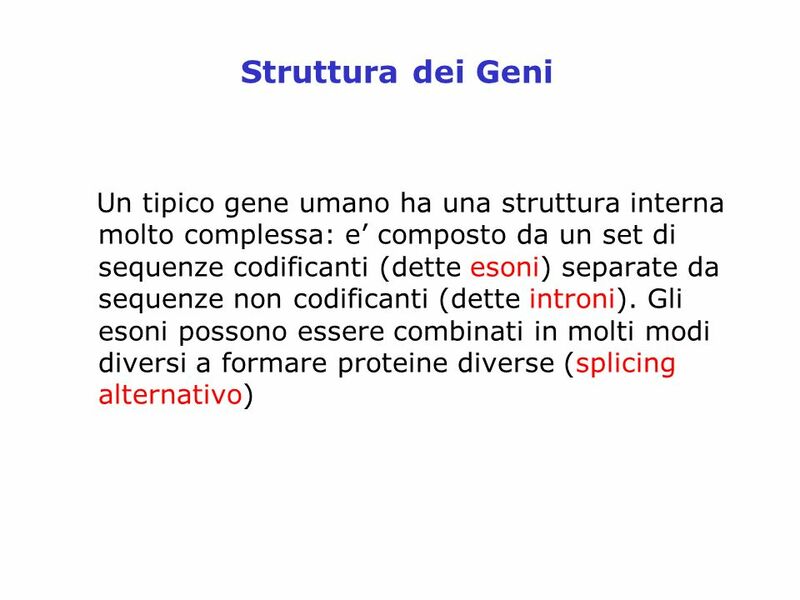 On the other hand, the DNA segment in which the transcription must occur, the situation is something like this: you have the coding segment unpacked, together with the adjacent DNA areas. 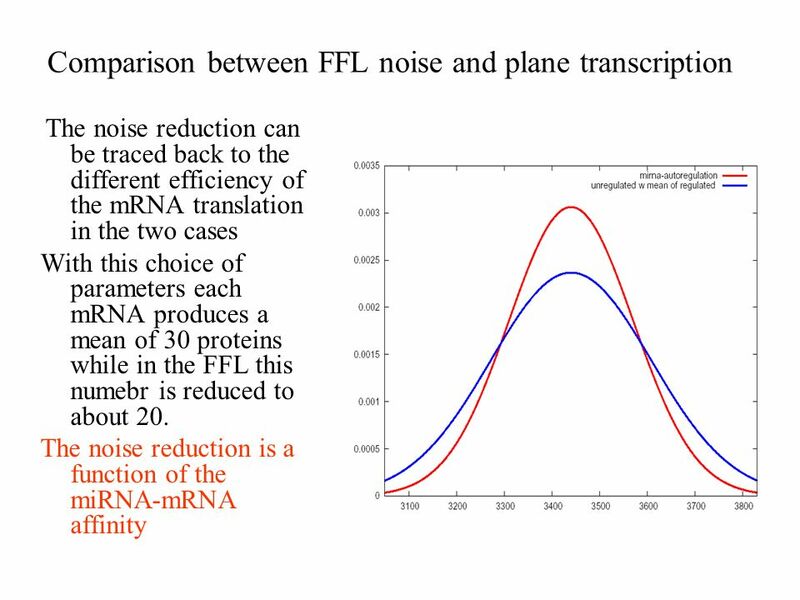 In particular, in the DNA sequence upstream of the gene, there are different items, usually called TFBS (this guy here, and this other guy here), that are recognized from special proteins called TF and allow the formation of the translation complex and the start of the translation itself by the action of the RNA polymerase II. 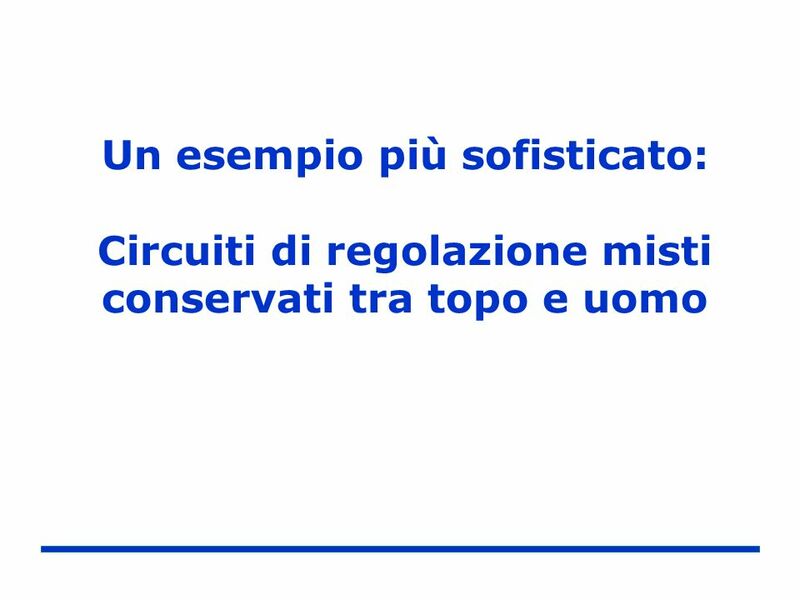 Negli eucarioti superiori la risposta trascrizionale è organizzata in un network. 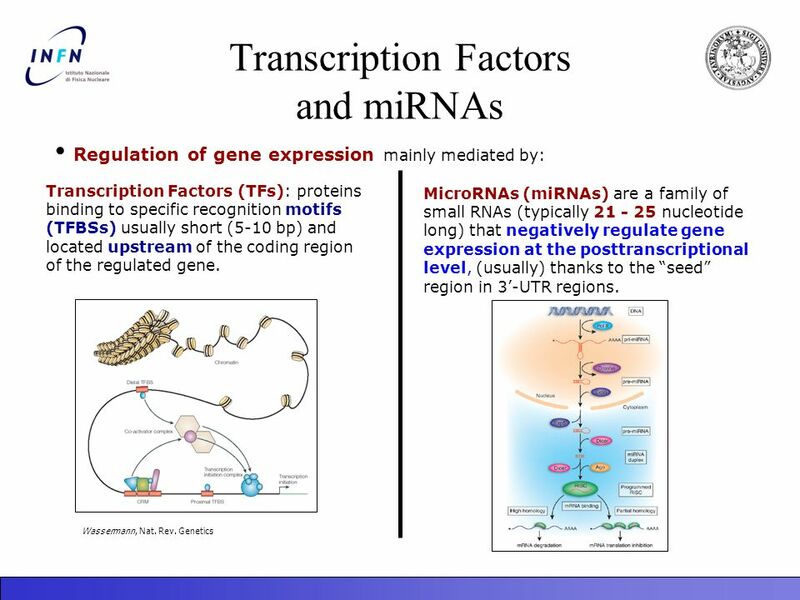 In higher eukariotes, the regulation of transcription is a very complex event. If you look at this picture, taken from a very recent review on Nature, you can distinguish the basic items involved in transcription of a certain gene. The DNA is usually packed in a very complex way, called “chromatin”, and, in this situation the DNA sequence is non accessible by the transcriptional machinery. On the other hand, the DNA segment in which the transcription must occur, the situation is something like this: you have the coding segment unpacked, together with the adjacent DNA areas. 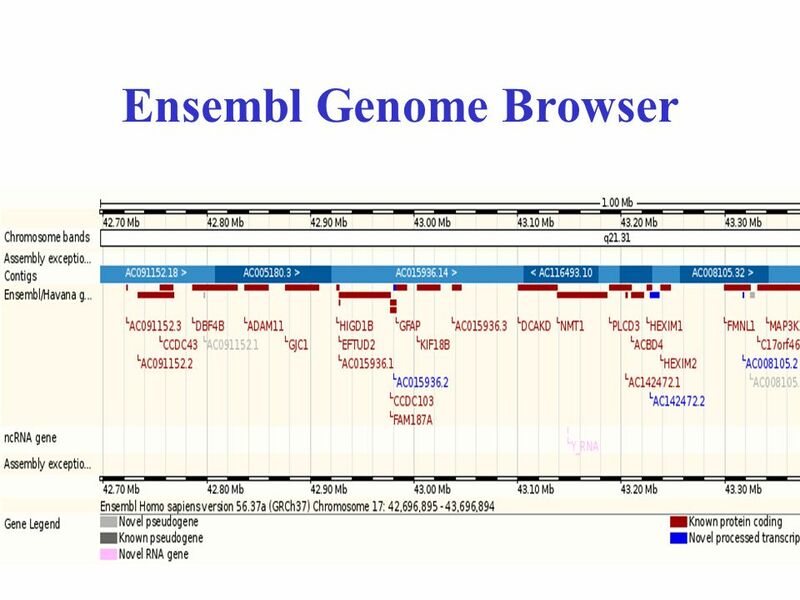 In particular, in the DNA sequence upstream of the gene, there are different items, usually called TFBS (this guy here, and this other guy here), that are recognized from special proteins called TF and allow the formation of the translation complex and the start of the translation itself by the action of the RNA polymerase II. 36 Dove è nascosta l’informazione? 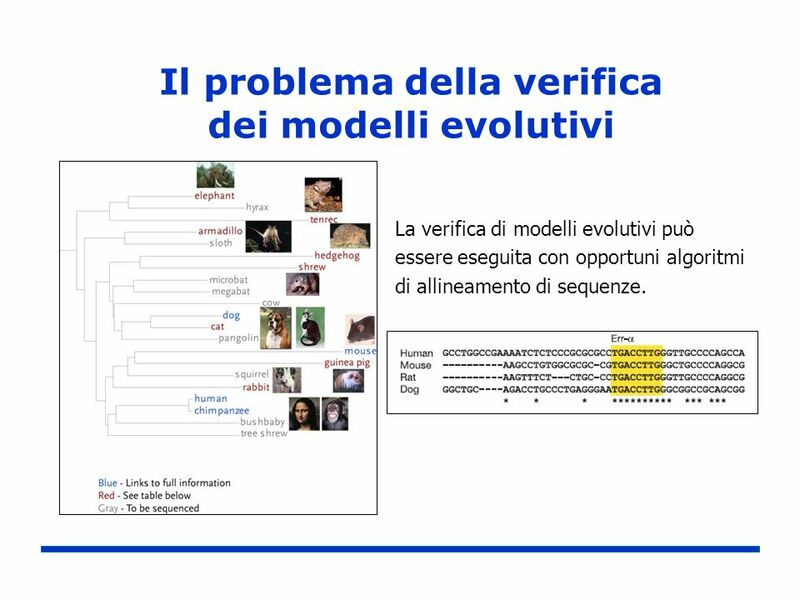 Obiettivo: identificare, a partire dalla sola sequenza genomica, dei candidati TFBS ovvero identificare il “vocabolario” di DNA motifs che regolano l’espressione dei geni. 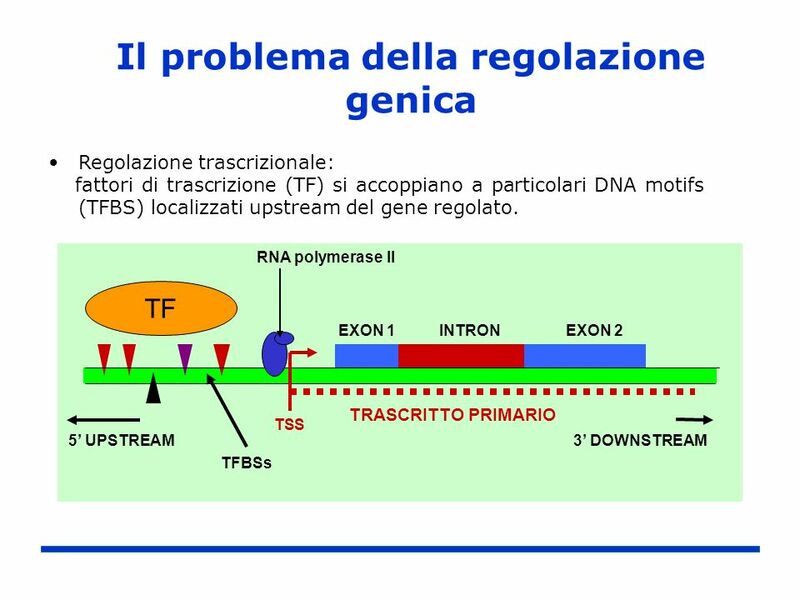 TFBS sono di solito corti (5-20 bp di DNA). 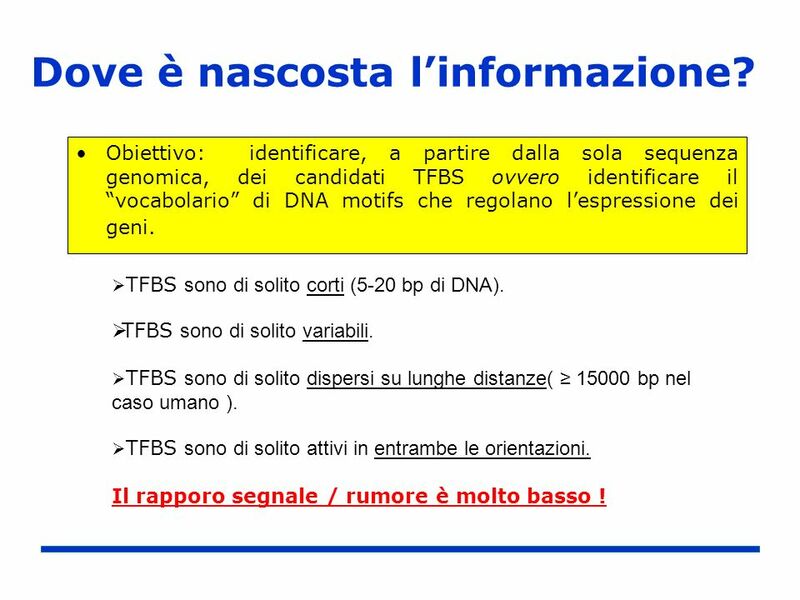 TFBS sono di solito variabili. 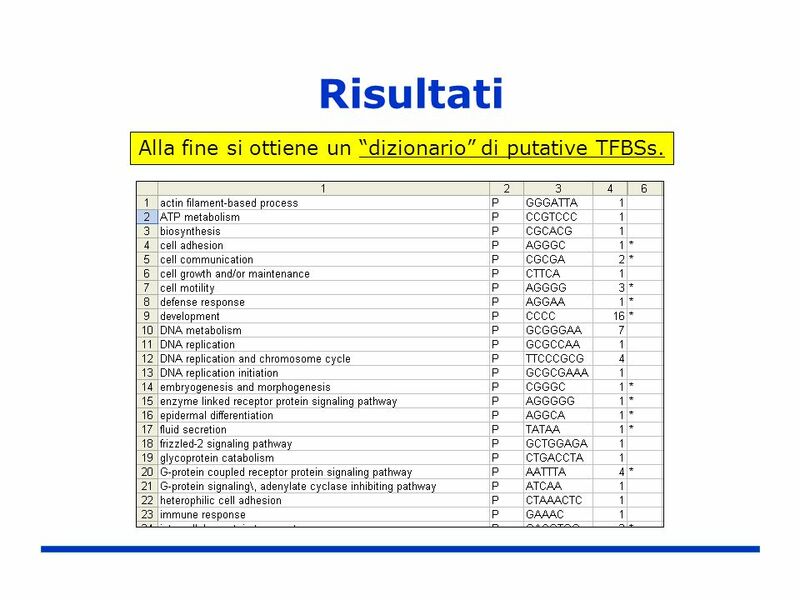 TFBS sono di solito dispersi su lunghe distanze( ≥ bp nel caso umano ). TFBS sono di solito attivi in entrambe le orientazioni. Il rapporo segnale / rumore è molto basso ! With the biological bases previously outlined, this is the problem in which we are interested. 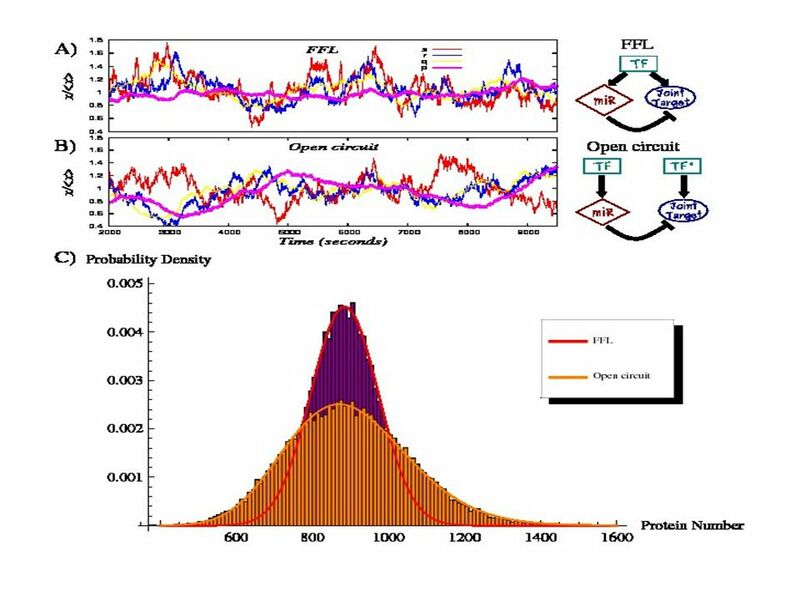 Our goal is to develop a computational approach for the identification of transcription factor binding sites. Which are the problem and the difficulties due to this task ? 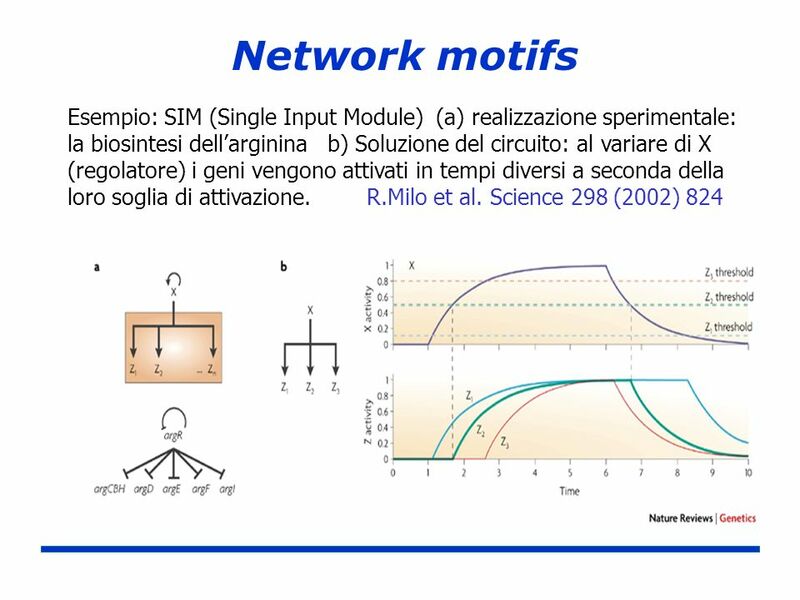 ... Leggere lucido This is the point of my talk: we want to find the items that act as the “control of my machinery”, but the signal to noise ration is extremely low. So we need ideas to perform our task. 37 Risultati Alla fine si ottiene un “dizionario” di putative TFBSs. 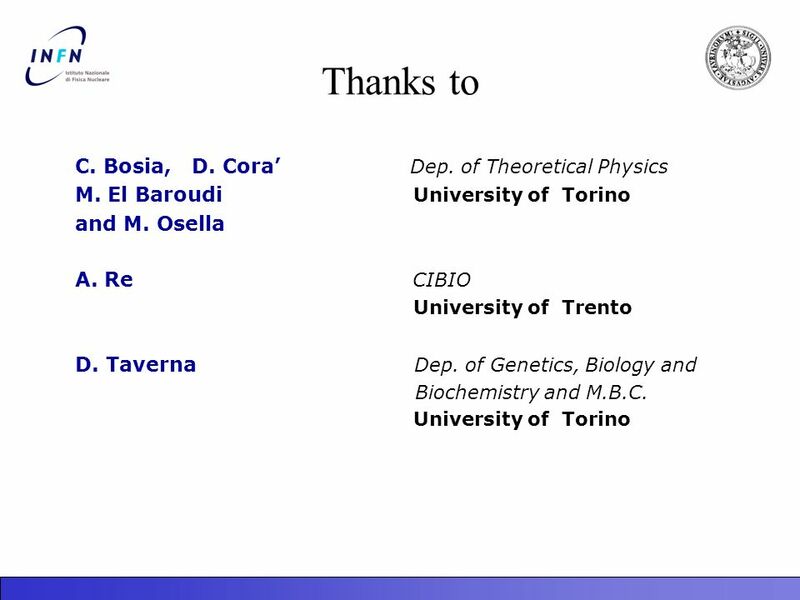 That’s the final point: the result of our algorithm is a sort of list, of “dictionary” of words that, according our work-flow, are putative TFBS. Each word is connected to one or more GO term and eventually to a microarray timepoints (see * in the table). Let us now concentrate into 3 points: robustness, validation and prediction. 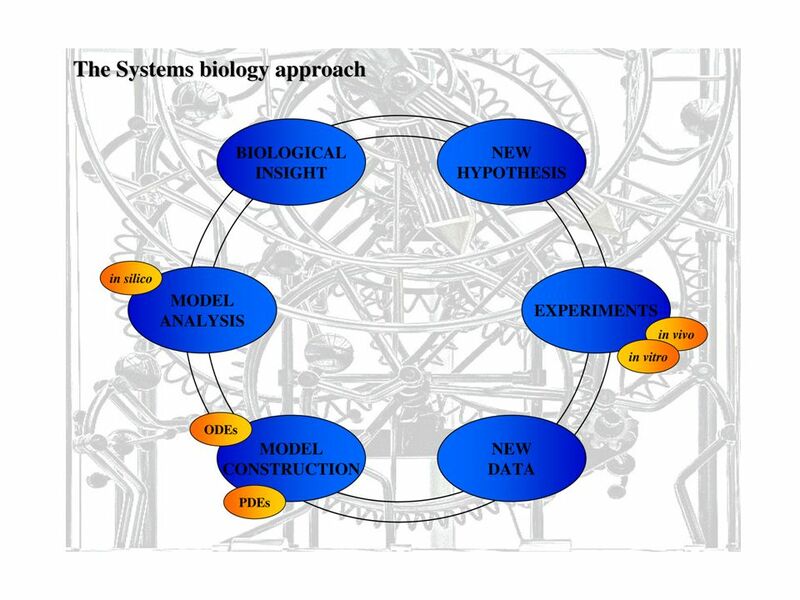 The starting point of our work is the sequence of the human genome. As you know, some years ago the sequence of the human genome was completed. 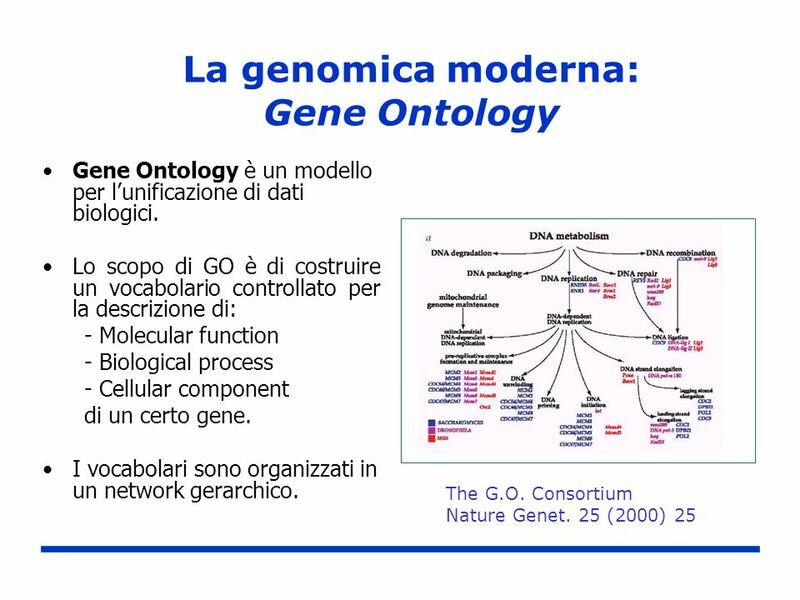 This is a very simplified picture (in order to make short a very long story ) but, basically, today we know that the landscape of the human genome can be divided in two different parts: - The first part includes the so called “coding” information. 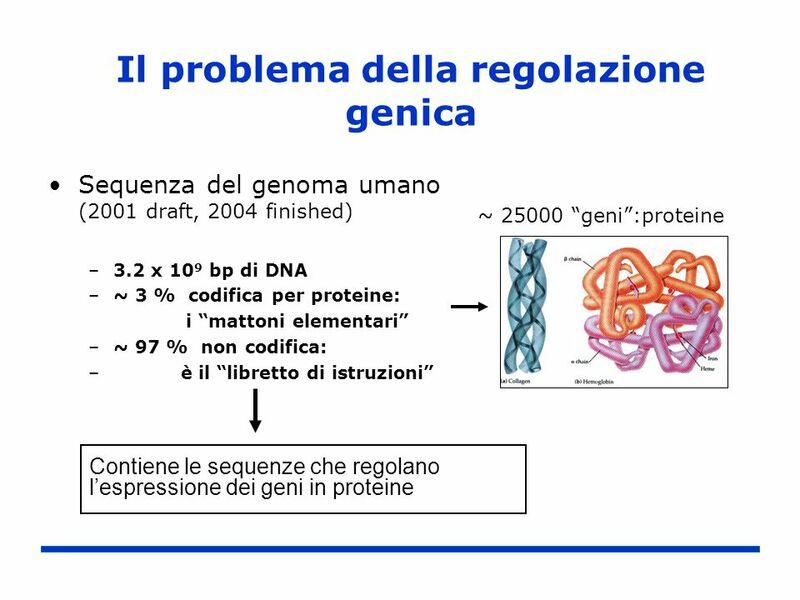 We usually call in “genes”, and inside it is stored the information about the construction of our proteins. We can think about it as “machinery of my body”. However, most of the human genome contains sequences with no coding information. This part is really complicated in structure, but, basically, we can say that this part is devoted to the “control of my machinery”. For many reasons, currently the problem of understanding what we call "control of my machinery” is really one of the greatest challenge in post-genomic biology. Our work is essentially a step along this research line. 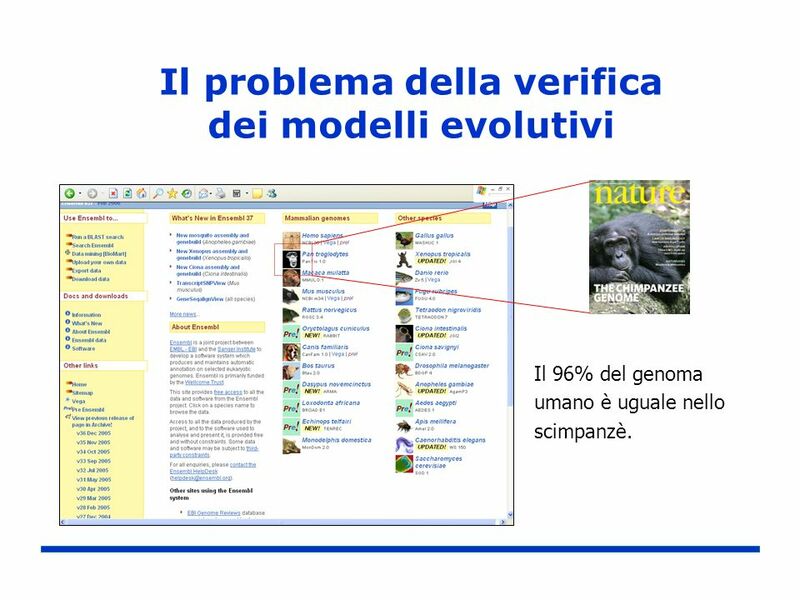 La verifica di modelli evolutivi può essere eseguita con opportuni algoritmi di allineamento di sequenze. 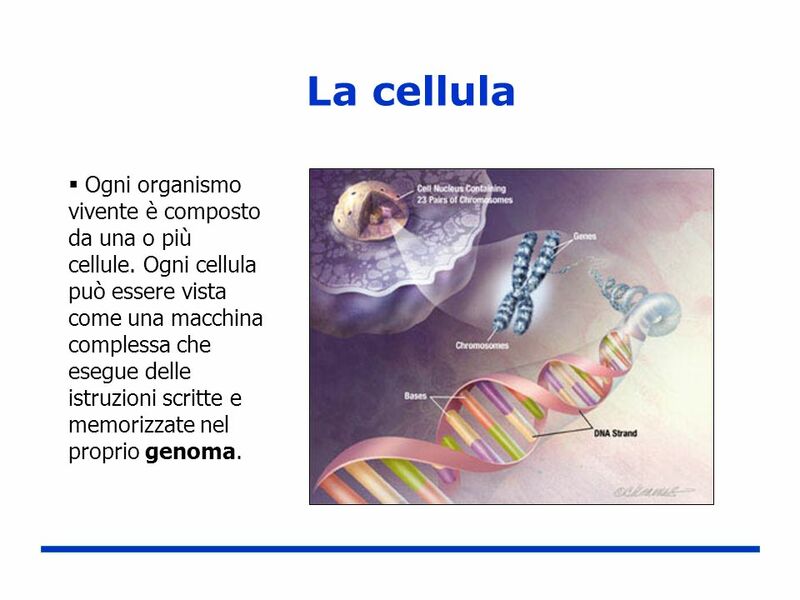 The starting point of our work is the sequence of the human genome. As you know, some years ago the sequence of the human genome was completed. 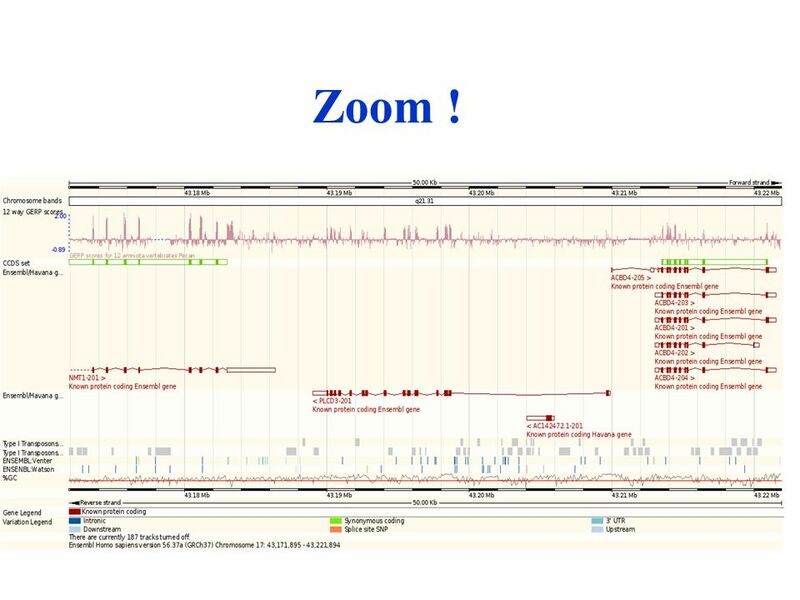 This is a very simplified picture (in order to make short a very long story ) but, basically, today we know that the landscape of the human genome can be divided in two different parts: - The first part includes the so called “coding” information. 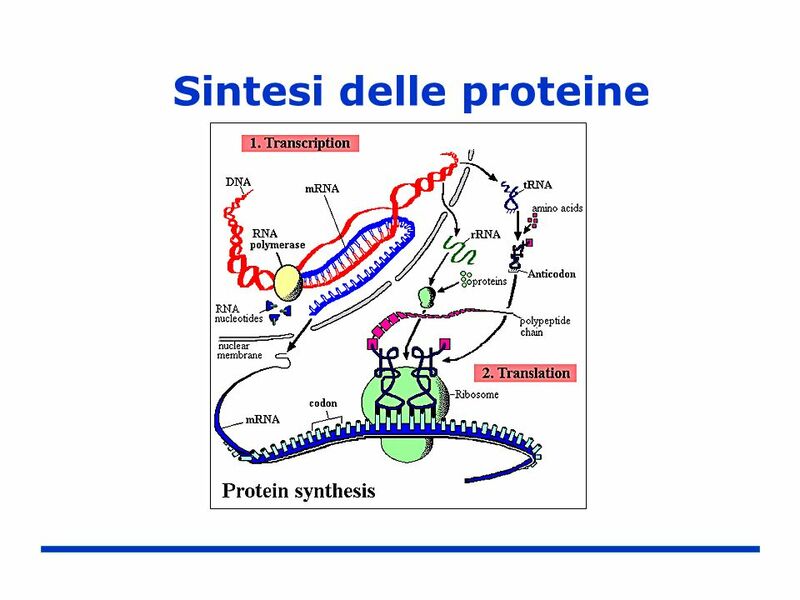 We usually call in “genes”, and inside it is stored the information about the construction of our proteins. We can think about it as “machinery of my body”. However, most of the human genome contains sequences with no coding information. This part is really complicated in structure, but, basically, we can say that this part is devoted to the “control of my machinery”. For many reasons, currently the problem of understanding what we call "control of my machinery” is really one of the greatest challenge in post-genomic biology. Our work is essentially a step along this research line. 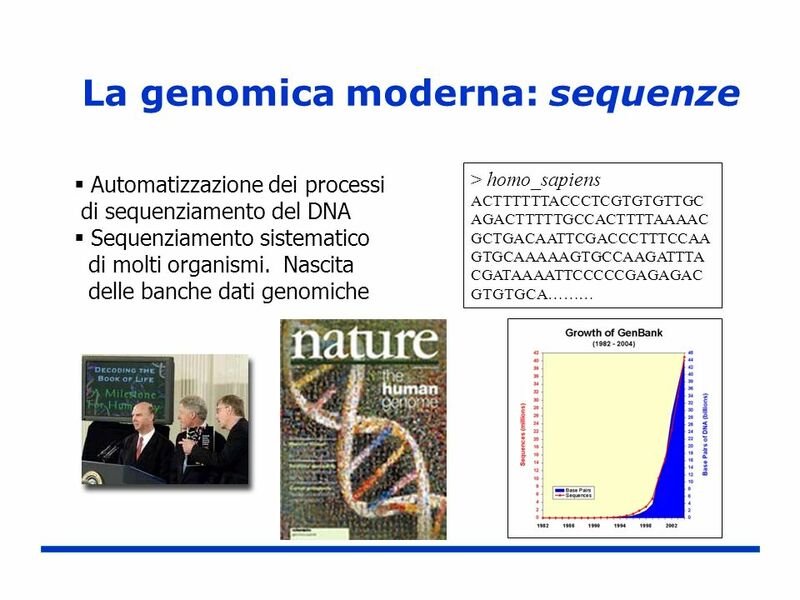 The starting point of our work is the sequence of the human genome. As you know, some years ago the sequence of the human genome was completed. 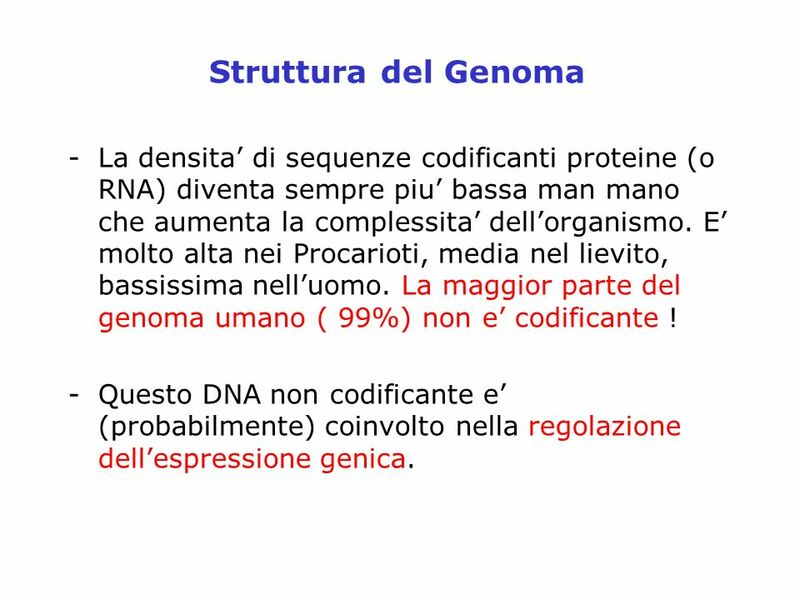 This is a very simplified picture (in order to make short a very long story ) but, basically, today we know that the landscape of the human genome can be divided in two different parts: - The first part includes the so called “coding” information. 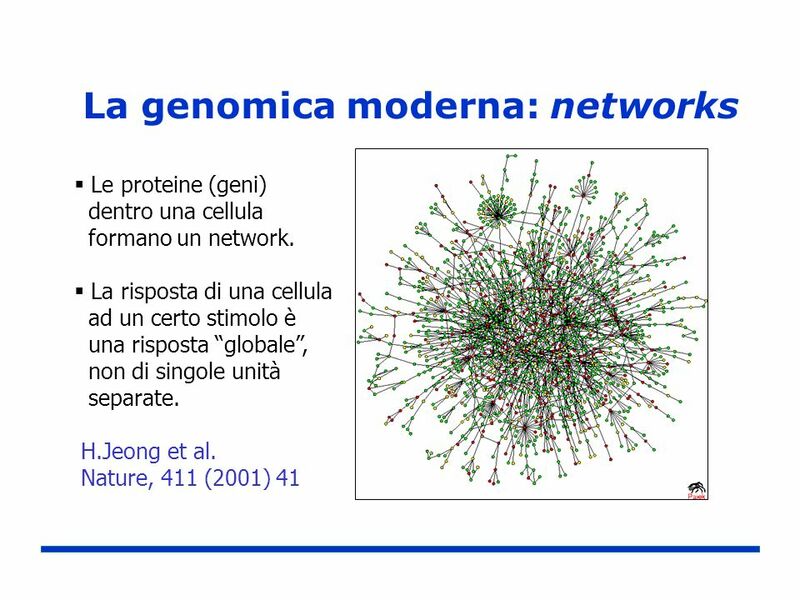 We usually call in “genes”, and inside it is stored the information about the construction of our proteins. We can think about it as “machinery of my body”. However, most of the human genome contains sequences with no coding information. This part is really complicated in structure, but, basically, we can say that this part is devoted to the “control of my machinery”. For many reasons, currently the problem of understanding what we call "control of my machinery” is really one of the greatest challenge in post-genomic biology. Our work is essentially a step along this research line. Il 96% del genoma umano è uguale nello scimpanzè. 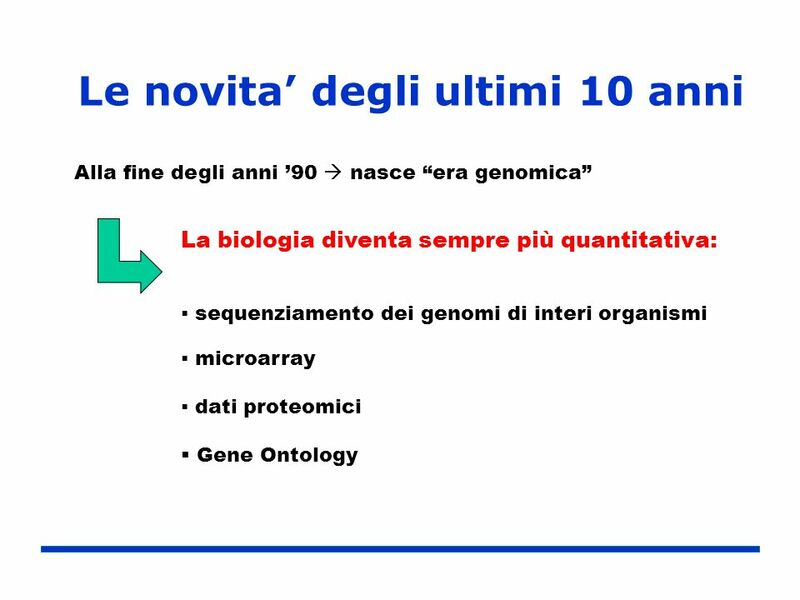 Obiettivo: identificare, a partire dalla sola sequenza genomica, i segnali dell’evoluzione dei geni nel tempo e tra i vari organismi e riconoscere i geni “ortologhi”. 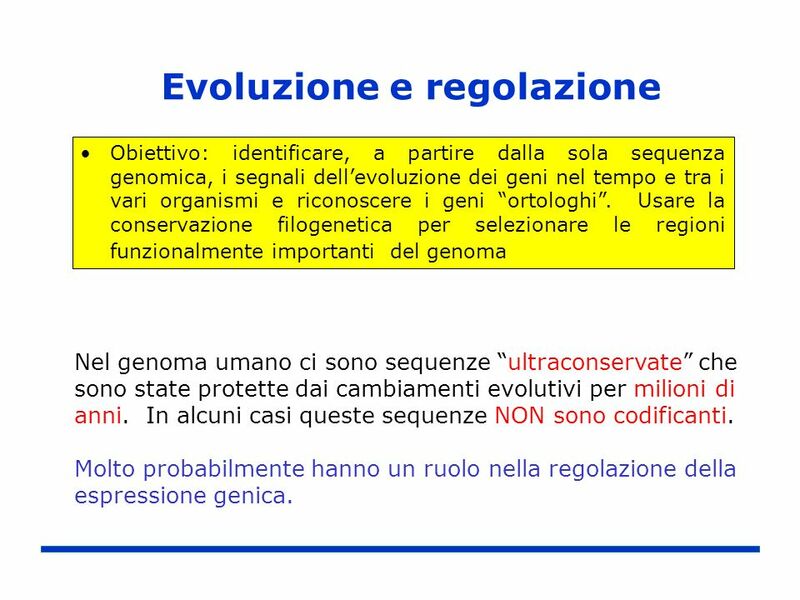 Usare la conservazione filogenetica per selezionare le regioni funzionalmente importanti del genoma The starting point of our work is the sequence of the human genome. As you know, some years ago the sequence of the human genome was completed. 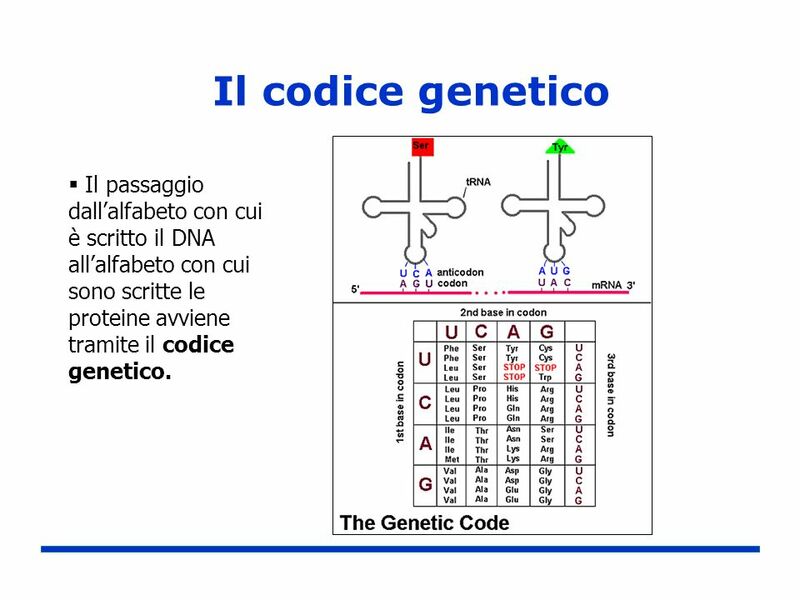 This is a very simplified picture (in order to make short a very long story ) but, basically, today we know that the landscape of the human genome can be divided in two different parts: - The first part includes the so called “coding” information. We usually call in “genes”, and inside it is stored the information about the construction of our proteins. We can think about it as “machinery of my body”. However, most of the human genome contains sequences with no coding information. This part is really complicated in structure, but, basically, we can say that this part is devoted to the “control of my machinery”. For many reasons, currently the problem of understanding what we call "control of my machinery” is really one of the greatest challenge in post-genomic biology. Our work is essentially a step along this research line. 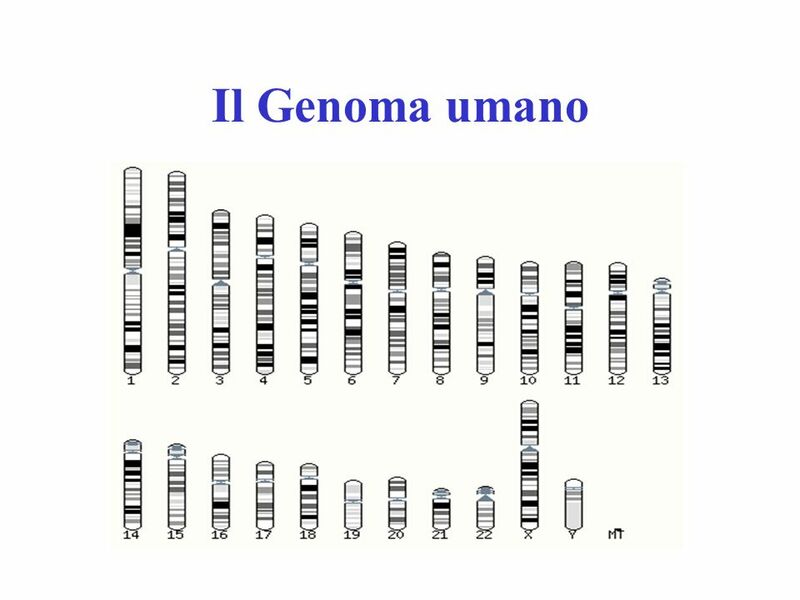 Nel genoma umano ci sono sequenze “ultraconservate” che sono state protette dai cambiamenti evolutivi per milioni di anni. In alcuni casi queste sequenze NON sono codificanti. Molto probabilmente hanno un ruolo nella regolazione della espressione genica. 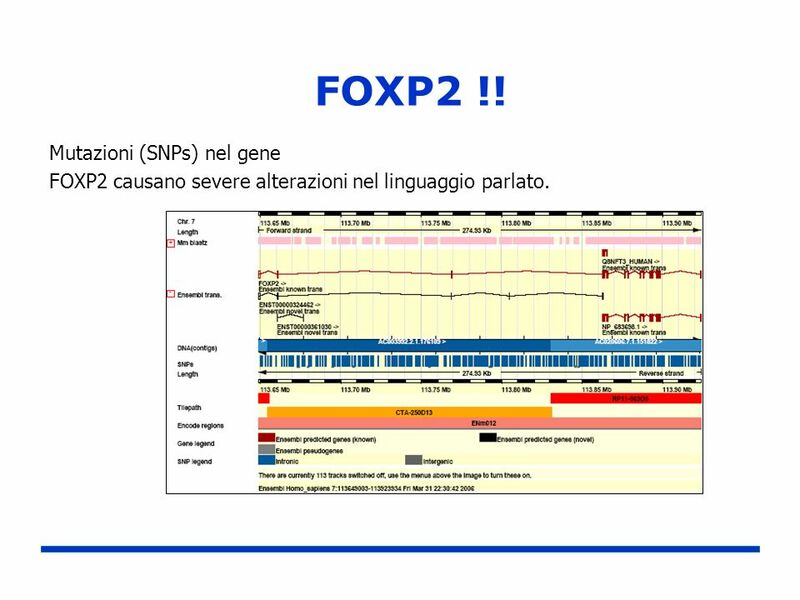 FOXP2 causano severe alterazioni nel linguaggio parlato. 45 Hornstein E, Shomron N, Nat Genet 38 Suppl:S20–4 (2006). 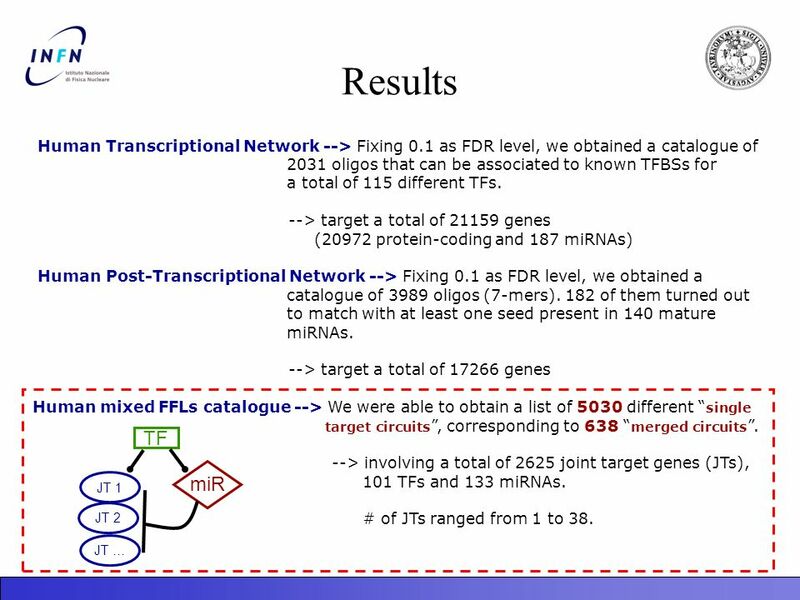 Our Project Several methods exist to study, separately TF-related and microRNA-related regulatory networks, but comparable information is lacking to explicitly connect them. 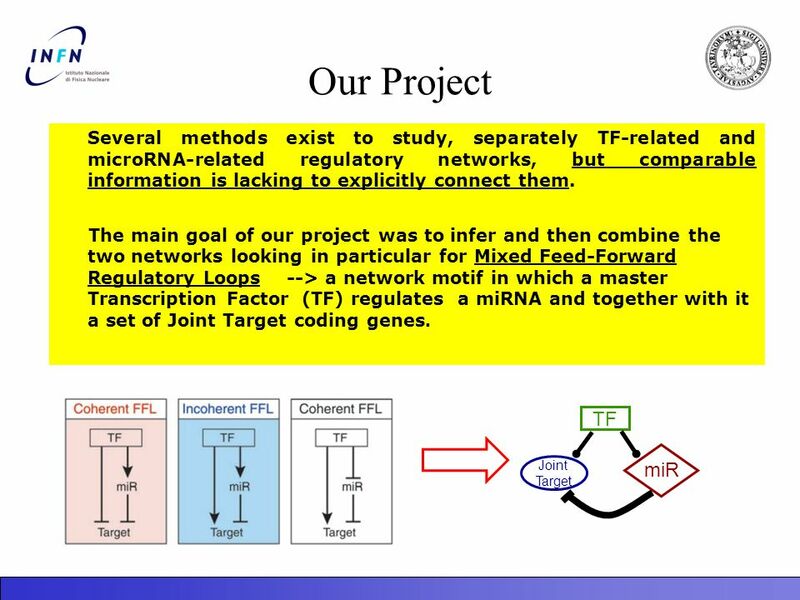 The main goal of our project was to infer and then combine the two networks looking in particular for Mixed Feed-Forward Regulatory Loops --> a network motif in which a master Transcription Factor (TF) regulates a miRNA and together with it a set of Joint Target coding genes. 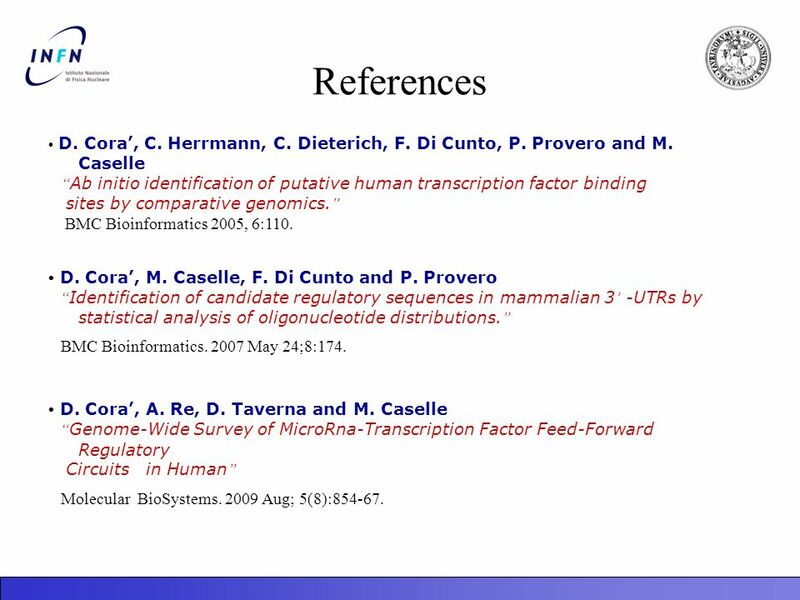 In this talk, we report the results of a genome-wide integration study of a transcriptional and post-transcriptional regulatory network, in human, based on a bioinformatic sequence-analysis work. 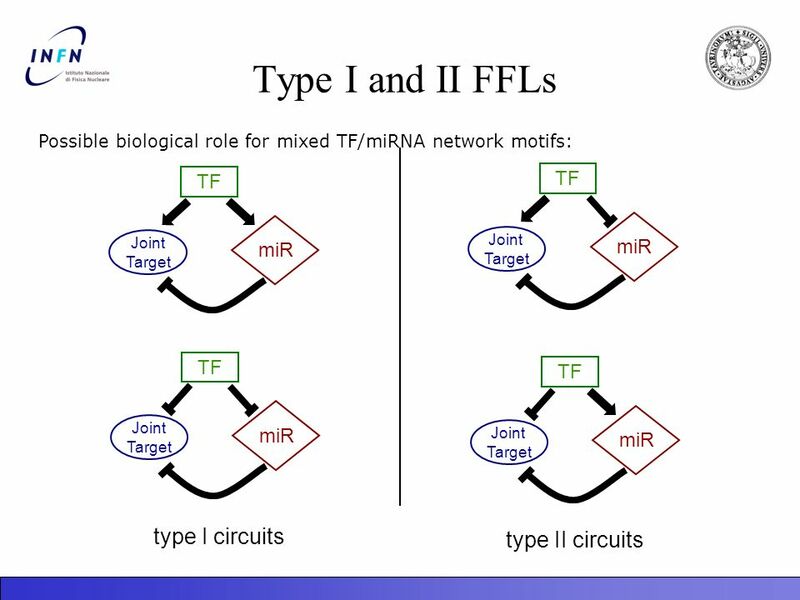 In particular, we focused in the study of functional and statistical properties of a special class of network motifs, the mixed TF/microRNA feed-forward circuits, recently proved to be of significant importance. TF Joint Target miR Hornstein E, Shomron N, Nat Genet 38 Suppl:S20–4 (2006). 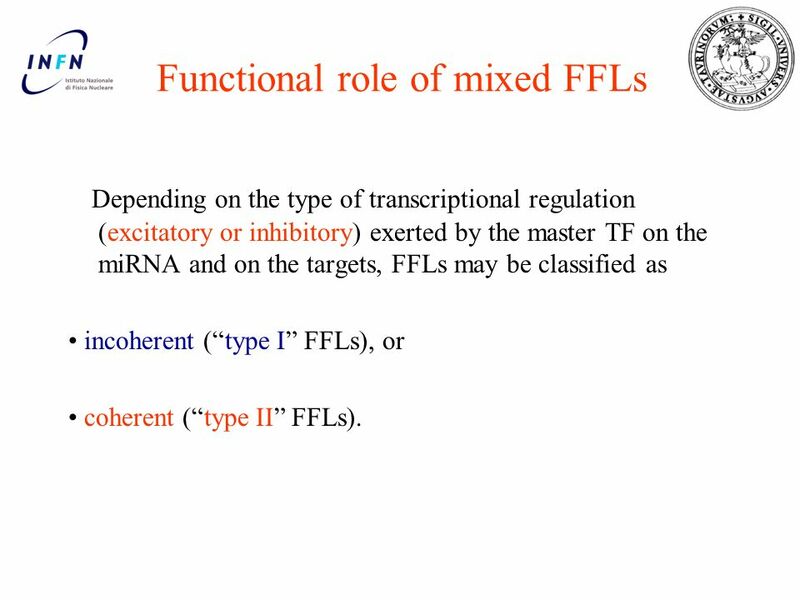 Depending on the type of transcriptional regulation (excitatory or inhibitory) exerted by the master TF on the miRNA and on the targets, FFLs may be classified as • incoherent (“type I” FFLs), or • coherent (“type II” FFLs). 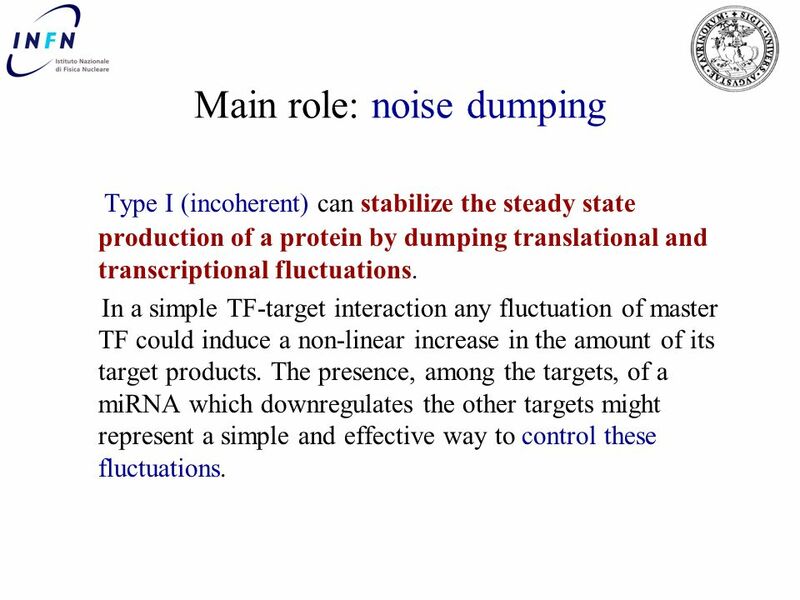 Type I (incoherent) can stabilize the steady state production of a protein by dumping translational and transcriptional fluctuations. In a simple TF-target interaction any fluctuation of master TF could induce a non-linear increase in the amount of its target products. 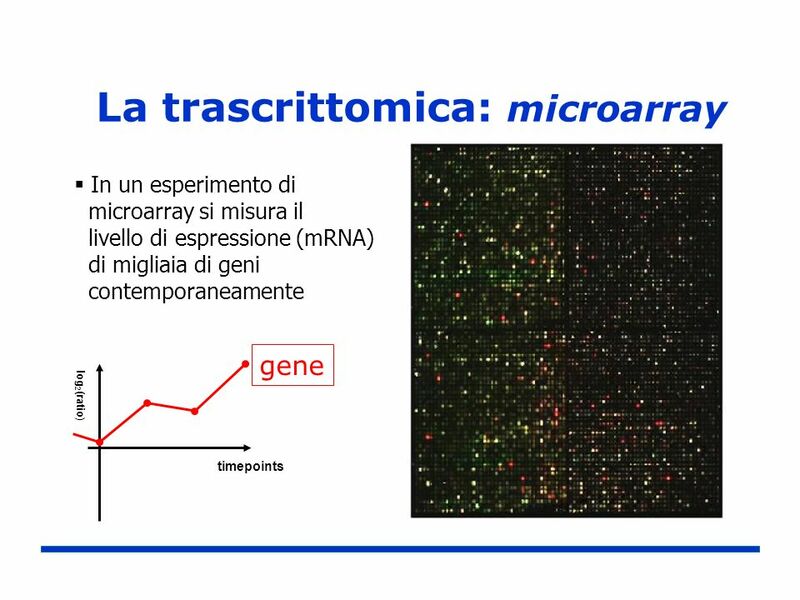 The presence, among the targets, of a miRNA which downregulates the other targets might represent a simple and effective way to control these fluctuations. 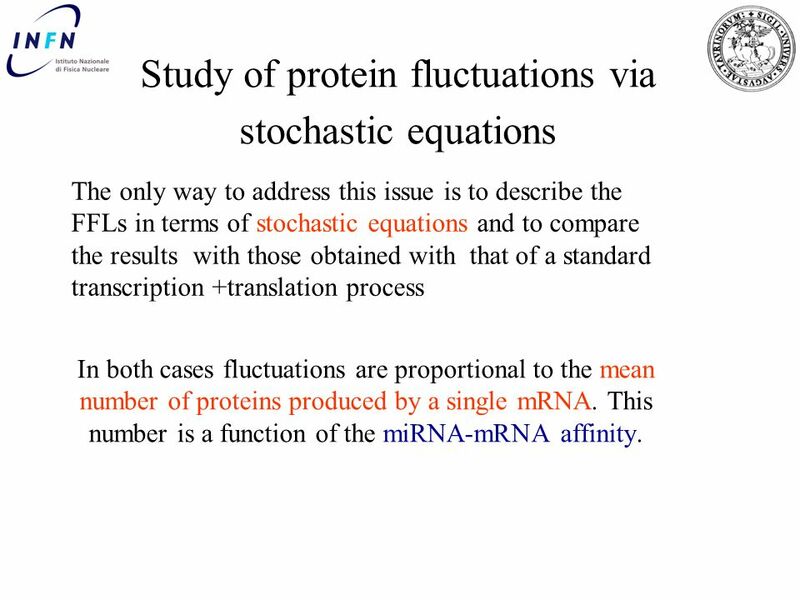 The only way to address this issue is to describe the FFLs in terms of stochastic equations and to compare the results with those obtained with that of a standard transcription +translation process In both cases fluctuations are proportional to the mean number of proteins produced by a single mRNA. 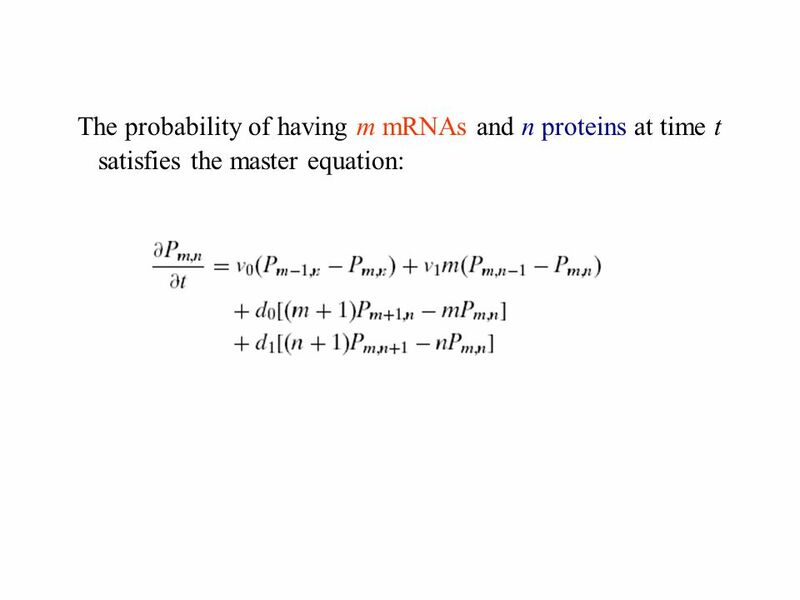 This number is a function of the miRNA-mRNA affinity. 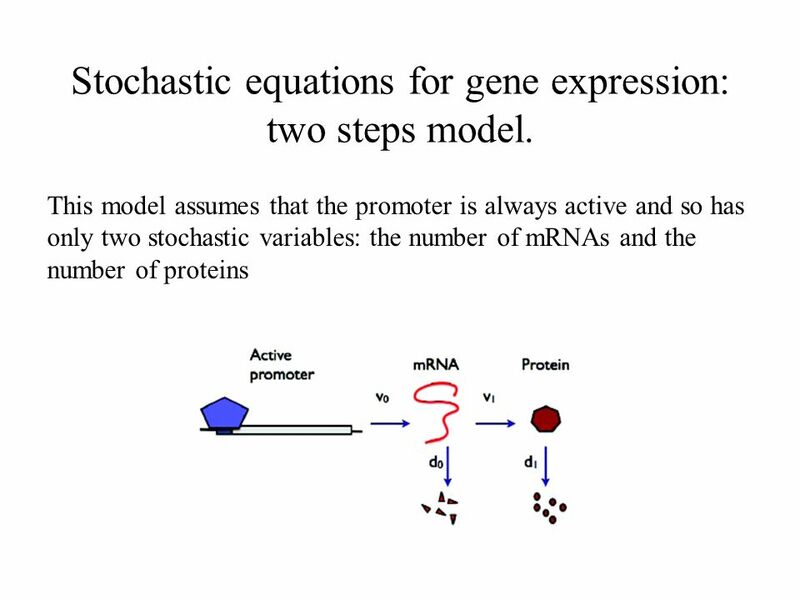 51 Stochastic equations for gene expression: two steps model. 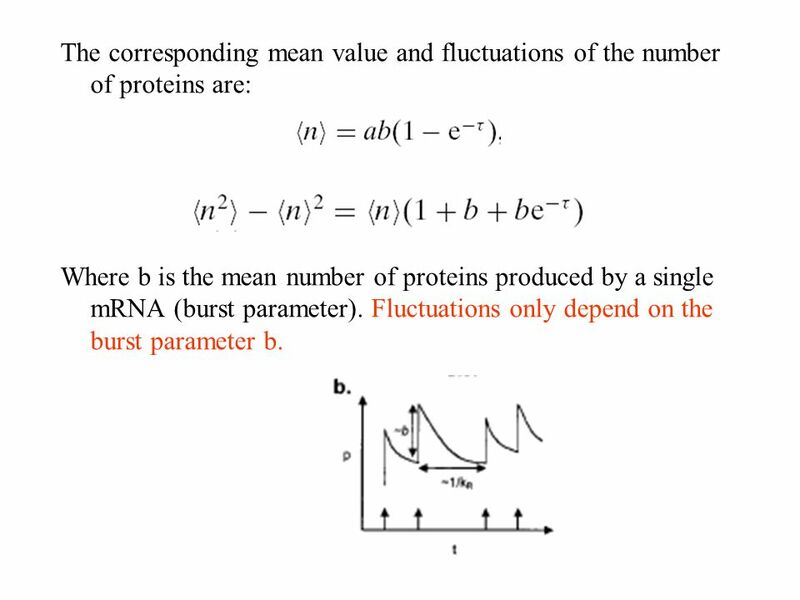 Where b is the mean number of proteins produced by a single mRNA (burst parameter). 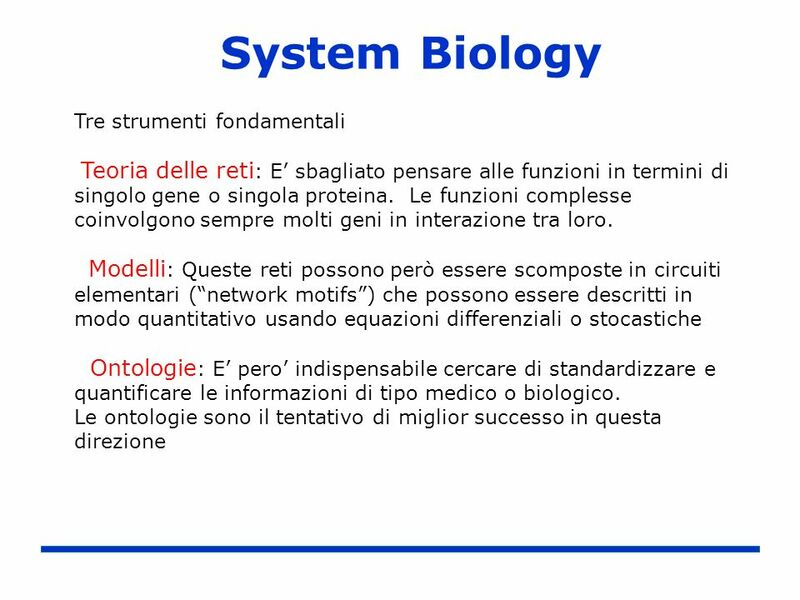 Fluctuations only depend on the burst parameter b.
Scaricare ppt "“System Biology”: un nuovo paradigma per la biologia molecolare." 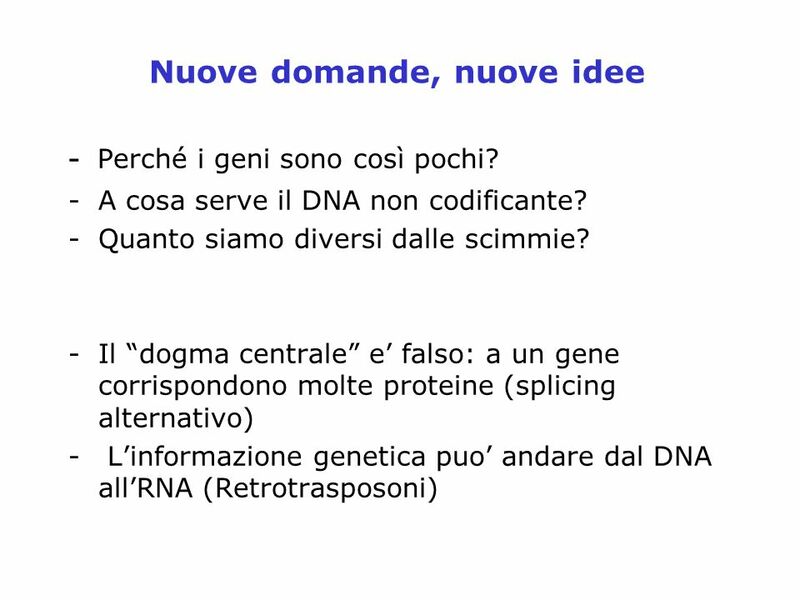 Trascrizione Processo mediante il quale l’informazione contenuta in una sequenza di DNA (gene) viene copiata in una sequenza complementare di RNA dall’enzima. 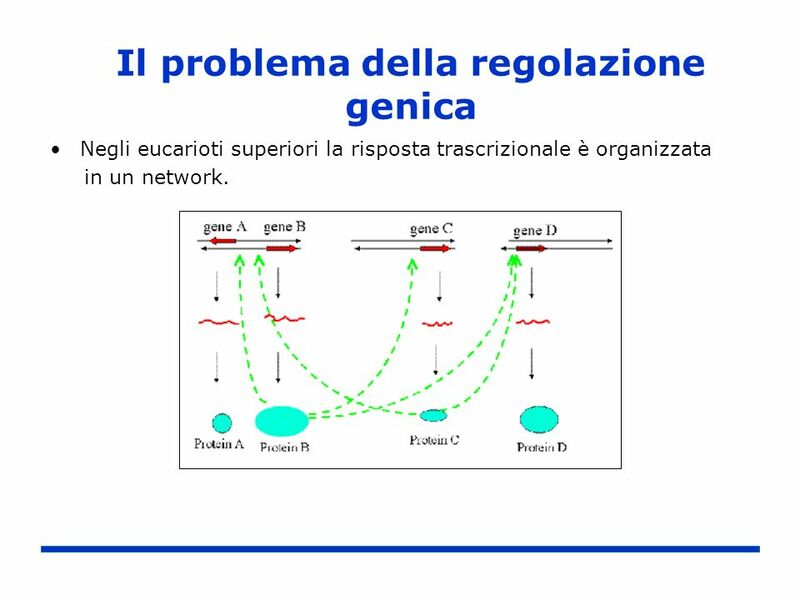 RNA interference Premio NOBEL 2006 Fire e Mello. 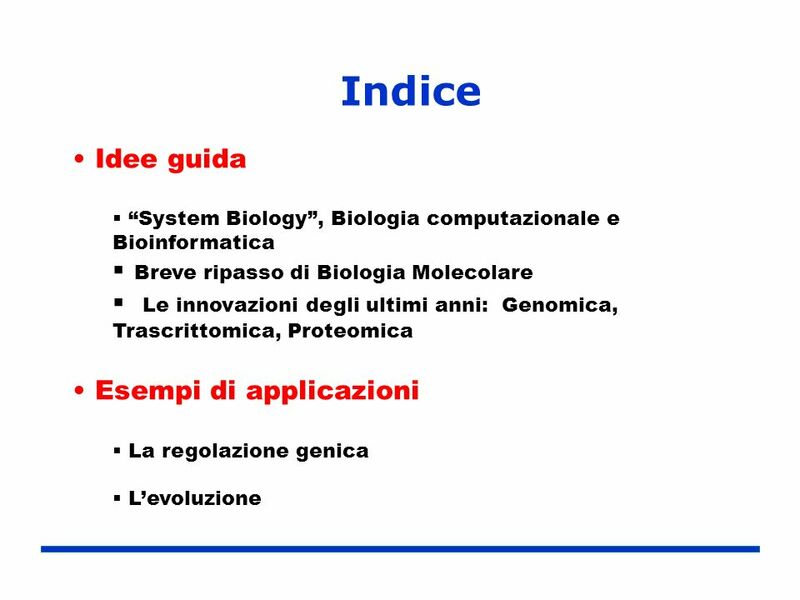 Bioinformatica Andrea G. B. Tettamanzi. 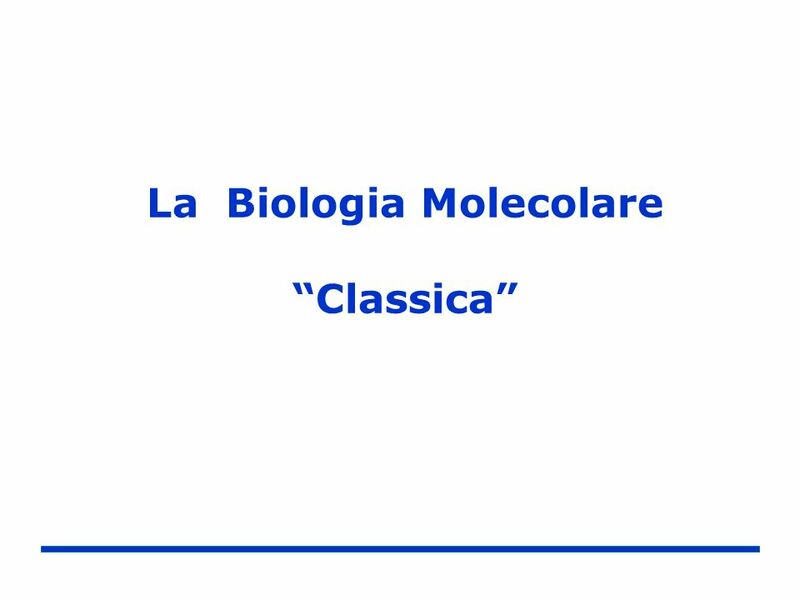 Genetica diretta e Genetica inversa: approcci sperimentali classici e metodologie recenti per lo studio della funzione dei geni.